With a stay at Riad Alaka in Marrakech (Medina), you'll be within a 10-minute drive of Jemaa el-Fnaa and Palais des Congres. This 4-star riad is 1.8 mi (3 km) from Menara Mall and 3.7 mi (5.9 km) from Menara Gardens. Make yourself at home in one of the 7 individually decorated guestrooms. Complimentary wireless Internet access is available to keep you connected. Private bathrooms with showers feature designer toiletries and hair dryers. Conveniences include safes and complimentary newspapers, and housekeeping is provided daily. Enjoy a range of recreational amenities, including an indoor pool, a spa tub, and a steam room. This riad also features complimentary wireless Internet access, a television in a common area, and tour/ticket assistance. Getting to nearby attractions is a breeze with the area shuttle (surcharge). Enjoy a meal at the restaurant or snacks in the coffee shop/café. 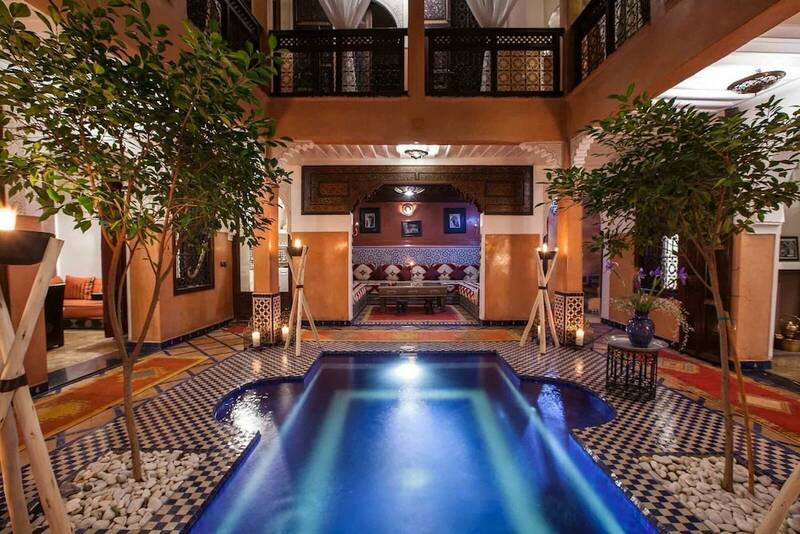 The riad also offers 24-hour room service. Wrap up your day with a drink at the bar/lounge. A complimentary full breakfast is included. A tax is imposed by the city: MAD 25 per person, per night. This tax does not apply to children under 8 years of age.